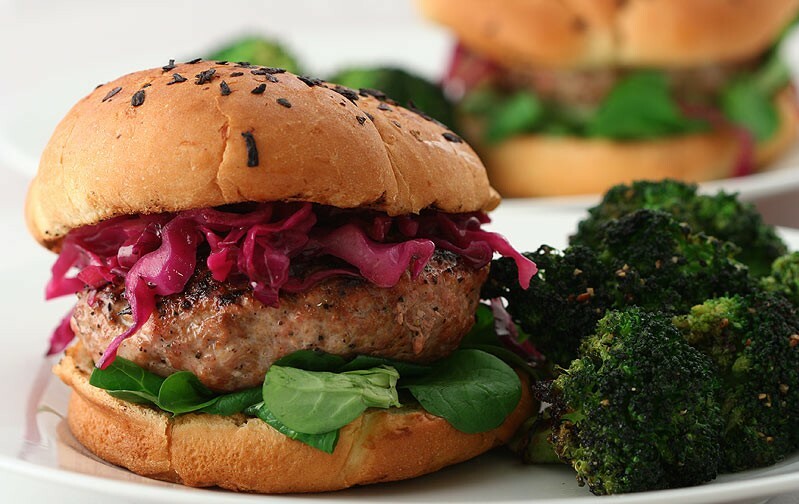 Turkey Burgers are not only delicious, but also one of the healthiest food options around. As they are light in fat and high in protein, they are good for your health. You may not find them in restaurants a lot, but they are a popular choice with home cooks because of their low calorie content. For the weight conscious as also for the one who is on his way building a sculpted body or for someone who just want to sample his taste buds with something delicious, Turkey burgers really make for an interesting meal. In a huge bowl, mix 1 pound lean turkey, ½ cup plain bread crumbs, pan spray, 2 teaspoons soya sauce, 2 teaspoon Worcestershire sauce, 1 tablespoon lemon juice, ¼ ketchup, finely chopped onions, pepper and optional condiments like mustard or pickles. Shape the mixture into four patties that is about half inch thick. If the mixture is sloppy or sticky, you can put some bread crumbs so that the mixture becomes firmer. You can lightly apply olive oil on the patties so that they do not stick while you are cooking them. Now grill the burgers till it is cooked thoroughly spending about 5 minutes on each side. Serve with crusty breads or toasted buns with garlic mayo or your favorite salad. Do not make use of extra lean turkey meat, because they make for dry burgers. Though you may feel it is a healthier option, it is just marginal, and not worth sacrificing the flavor part. If you want to place the Turkey burgers in the grill, make sure you defrost them. For defrosting a Turkey burger, you may place it in the microwave oven for three minutes or so on low power. Using fresh herbs like rosemary, cilantro or tomatoes can make the Turkey burgers look visually appealing. Before putting vegetables, sauté them for some time in olive oil. Use cooking spray on the grilling grates so that the burgers do not stick to the grill.